Question: I recently read an article that stated that exercise didn’t help with losing weight and that dieting only would do the job. Can you explain how that is true? Answer: First thing: you can’t out train a bad diet. We’ve been preaching that for years. The article didn’t explain in detail the research but if you dig into the actual details you see that there are issues with their conclusions. They determined that exercise alone will not burn a substantial enough amount of calories to make a huge difference in a weight loss program. If you walk on a treadmill for an hour and burn 300 calories, you haven’t made a significant dent in the amount of calories needed to lose a pound. You’ve barely burned off a biscuit. What they neglected was how exercise intensity can stimulate metabolic rate. The more intense the exercise, the more your metabolic rate is stimulated and can be slightly higher for several hours after exercising. We had a client using a metabolic reader. He walked into the gym at a 1.9 calories per minute burn rate. His rate climbed to 7.4 during training. He was in his car for four hours on a business trip after leaving the gym. During that time his estimated metabolic rate,according to his device, remained between 4 and 5 calories per minute. The study didn’t look at how exercise provides a metabolic after effect. Another part of the study determined that a group who exercises lost no more weight than a group who dieted but did not exercise. What they didn’t determine was which group actually lost more fat and not a combination of fat, water and muscle. If you cut carbs you’re going to lose water weight first and that can be a substantial amount during the first two weeks. If you’re not doing anything to maintain muscle which is what burns a tremendous amount of calories, then your body loses it. A final determination of the study revealed that those who exercise often engaged in rewarding themselves with foods they shouldn’t eat because they had exercised. They also found a small pattern with school kids who exercised as part of physical fitness at school would be less active during the day and those who didn’t exercise tended to be more active. As Arnold said years ago, ” to lose weight don’t lay down when you can sit. Don’t sit when you can stand. Don’t stand when you can walk and don’t walk when you can run .” Healthy eating makes a huge difference in weight loss and exercise can make that difference even greater which the study did state. 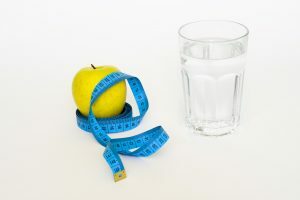 Both healthy eating and exercise are necessary for a successful weight loss program and maintaining a healthy lifestyle.